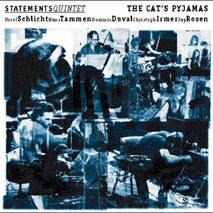 Statements Quintet is half German half American: Ursel Schlicht - piano, Hans Tammen - guitar, Dominic Duval - bass, Jay Rosen - drums, Christoph Irmer - violin. This quintet, which started as a duo of Ursel Schlicht and Hans Tammen in 1989, has developed a personal language and a totally unique sound which make them instantly identifiable. Total time: 59'18.